Yemen has been one of our most memorable stops - Salim, a wonderful guide introduced us to his country, and many friendly people collaborated to help us in a war-damaged country trying to recover from civil strife. North Yemen, a remnant of the Ottoman Empire after WWI and South Yemen, a British colony until the late 1960's fought until 1990 - are now united and trying to create a viable country with some success. We ducked into Aden after a nervous trip through a dangerous piracy area just to top up on fuel - and we had one of the most enjoyable stops of our trip so far. Aden Harbor is one of the largest natural harbors in the world, overlooked by an extinct volcano crater and a port with very little traffic. To get to the yacht anchorage we had to weave between ship mooring floats and other yachts to our spot in front of the 'night club' - little did we know that the loud, pounding music would play on 'til 3AM! 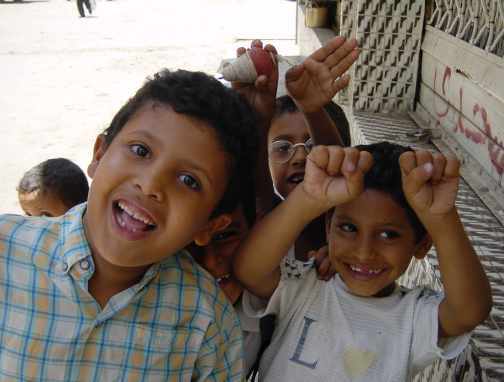 The welcoming committee consisted of 'Mohamed Ali', who handles laundry, and several drivers who politely offered their services after we checked in with Customs and Immigration - a painless process that resulted in a 'shore pass' good for Aden. We selected Salim, a driver recommended by other cruisers and were very happy with his services - including lunch at a local restaurant. Children - They were everywhere on the streets going to and from school, mostly neat and well-mannered - the very few beggars were reported to be Somali's, probably illegal immigrants or refugees. There seems to be hope for the country judging from the children. Street Vendors - Like many of the countries in the Middle East, vendors sold everything on the streets from veggies to electronics. All were friendly and polite, offering their wares and hoping to pose in a picture, but not pushy. This fellow was selling fragrant flower necklaces and many others were selling Qat. Qat is the mild narcotic drug of Yemen, wadded up in a cheek like chewing tobacco, and as the work day progresses the drug takes over. Salim condemned it strongly, but men, older children, and even some women seemed hooked by it. Low Tech - Salim took us down a side street, with camels offered for rides, to a small sesame oil factory. A small petrol engine swung a large arm with what appeared to be a tree trunk that mashed sesame seeds - after a few hours of this, the oil was poured off and the mash collected, probably for animal feed. It reminded us of the low-tech noodle factory in China. Salim - Without his guidance and driving, it would not have been the same. He treated us to lunch, dinner, and ice cream - and never asked for payment! We paid him, of course, but he left us with a warm feeling for his country. Other details and pix from this fascinating stop in Yemen can be seen on our April 2003 page - check it out! 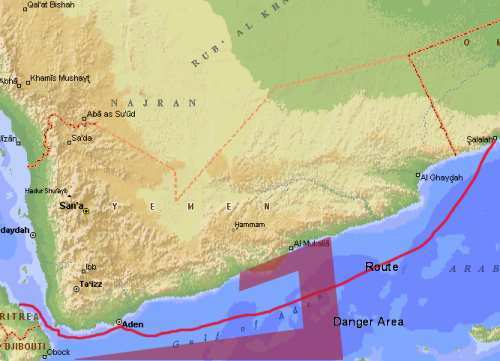 From Yemen, we headed through Bab el Mandeb to the Red Sea!